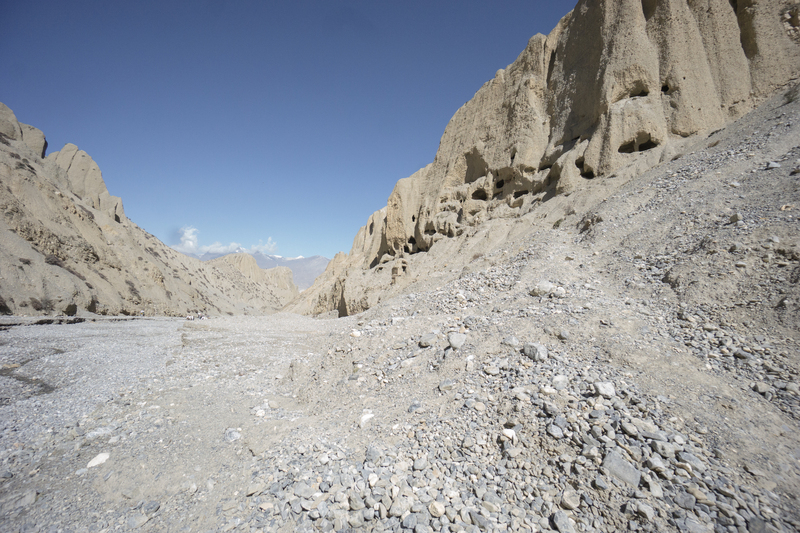 We were usually on the trail by 7:00 but today’s goal – Luri Gompa – was an easy walk only 3.5 kilometers away. By 6:30 I had already had my first cup of tea and walked behind the Rooftop Guesthouse for its great view of Yara. 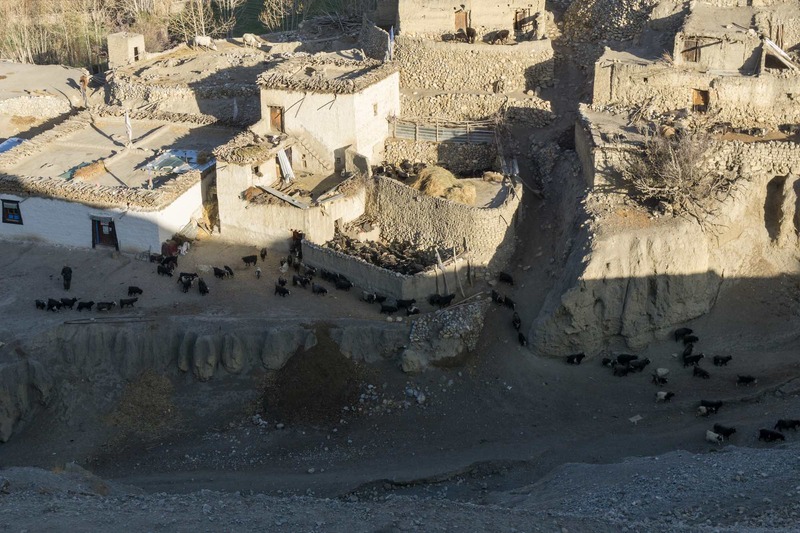 Down below the herder was releasing the animals from the pens for their daily rounds. The whitewashed Saribung Hotel was nicely lit up by the rising sun. 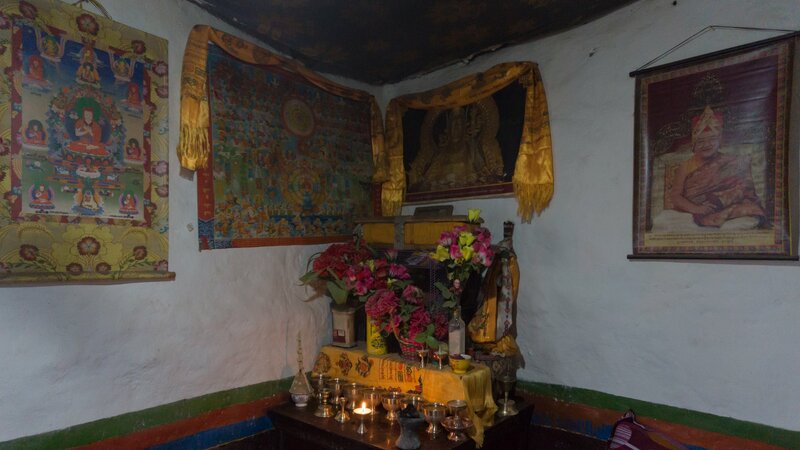 In the corner of our Yara guesthouse dining room was the shrine area you see below. 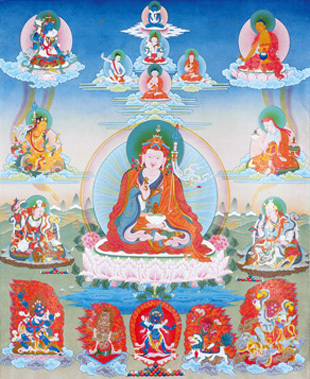 On the left-hand side was a thangka depicting the Eight Manifestations of Guru Rinpoche. 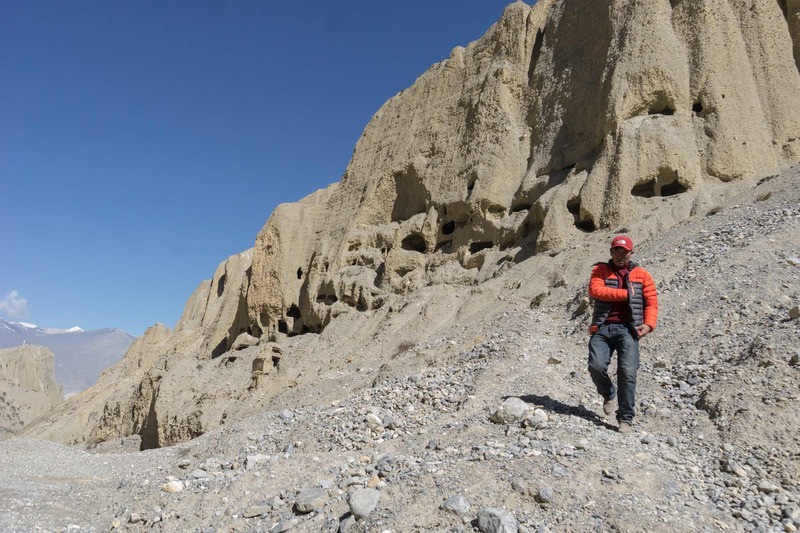 It is a common theme that we had seen a few times already in our walk up the Kali Gandaki. 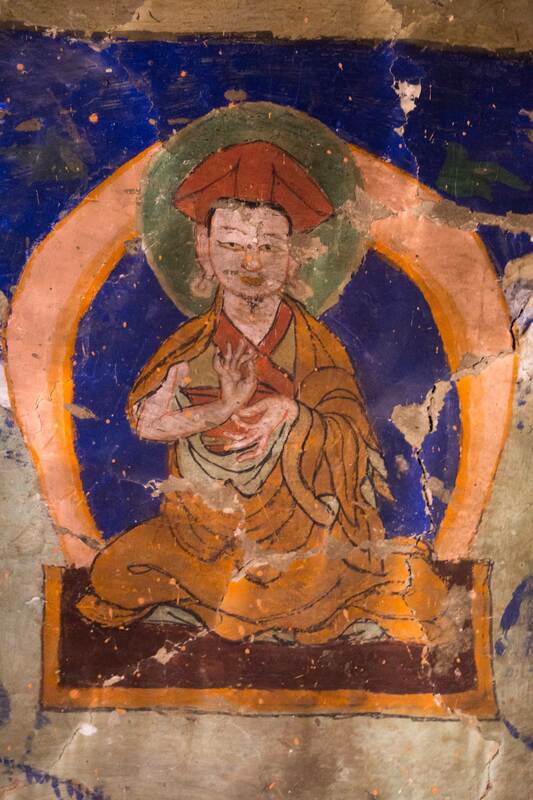 Here it was again, emphasizing the place held in Tibetan Buddhism by Padmasambhava, the Lotus-Born Second Buddha. He was the one who had come from India in the 700’s with the Buddhist doctrine and the magical powers to subdue the local malevolent spirits. On the right-hand side was a poster of someone unknown to me. When I got home I somehow googled my way to this image and his identity. 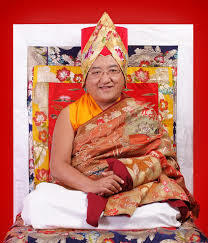 The poster is of Sakya Trizin Rinpoche, who was the 41st head of the Sakya lineage, one of the four major schools of Tibetan Buddhism. 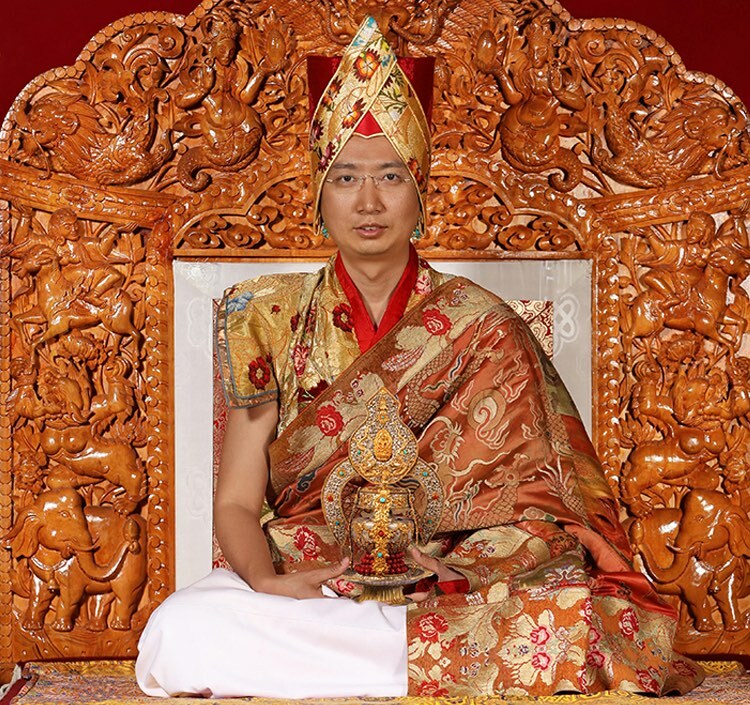 After serving as Trizin since his formal enthronement in 1959, his role as Trizin passed on to his son in 2017. A few years before, a new format of succession had been adopted which allows a living Trizin to step aside and allow his son to be the throne holder. Reading this account of his family’s divine origins, I now have a better idea of what those living in the guesthouse see when they look at the poster. I also get to see yet again that I have little idea of what real-life Buddhists in Asia understand Buddhism to be! The Buddhism in my head – stripped as it is of all mythological and supernatural elements, as well as pointless ritual – could not be more different! 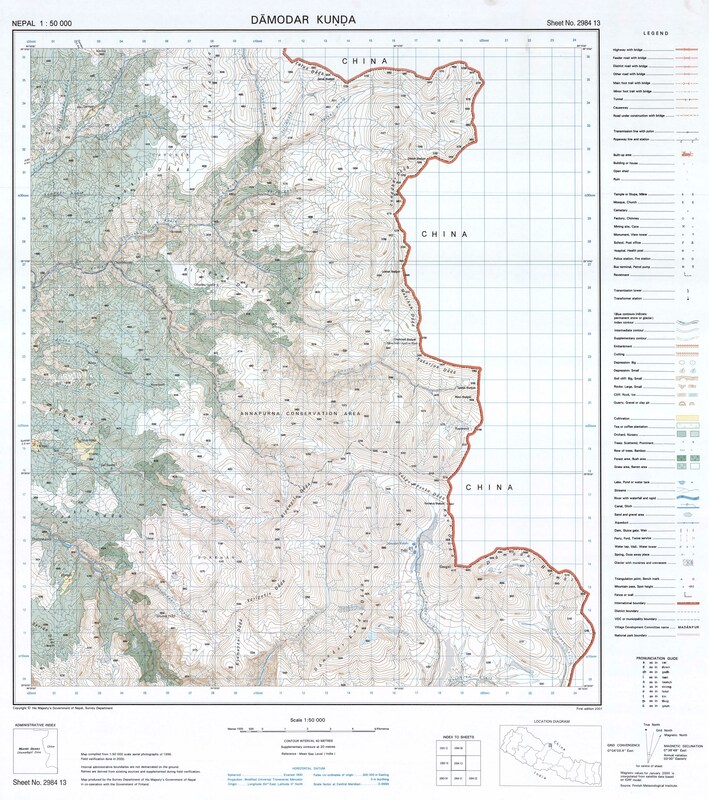 I have probably not located Tashi Kabum in the right location! 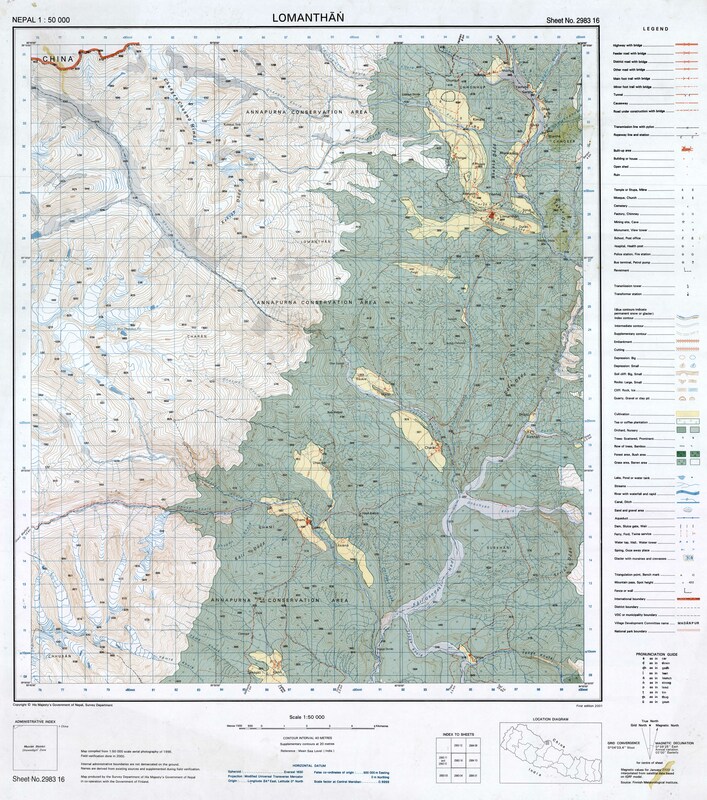 It is on the north side of the river (Puyun Khola) and is probably in that prominent vertical rock face a bit to the west (i.e. left) of my label. In any case, any groups going there will be in the care of a guide who will have made arrangements for the door to be unlocked and he will know the exact location! Tashi Kabum was the first of two cliff cave temples we would visit this day. 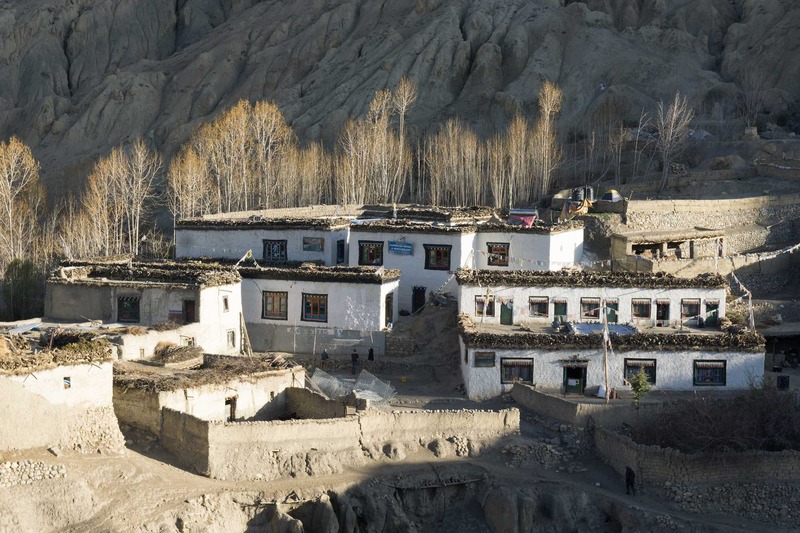 While the existence of the Luri site has been known for some time, Tashi Kabum entered into public awareness not much more than thirty years ago. 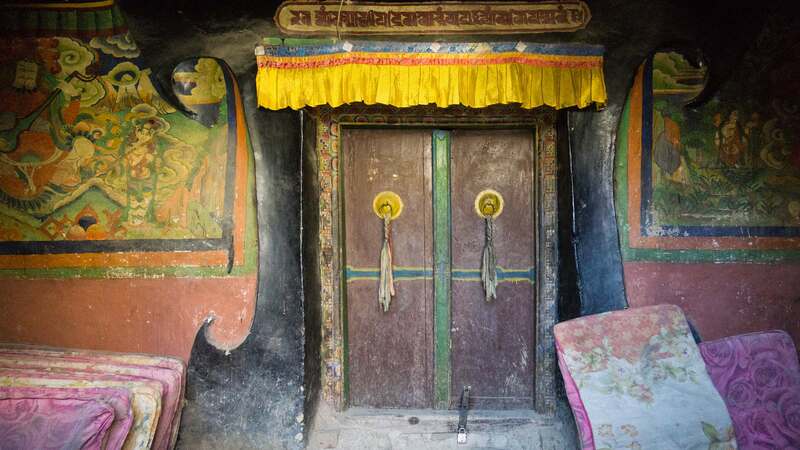 Both it and the one at Luri Gompa date back about seven hundred years and are now in the care of Yara villagers, who have the keys to unlock doors and who have also done things like upgrade access to the caves, as well as other maintenance and repair work. 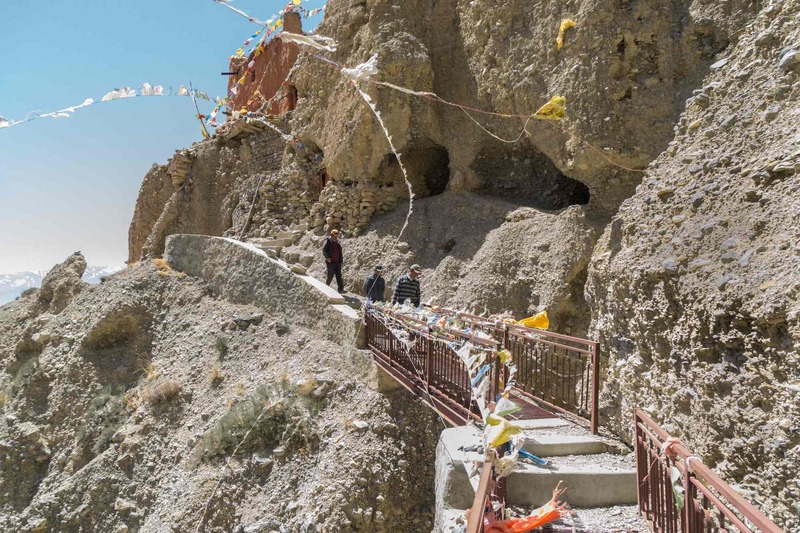 Both caves have a nominal charge and photography is allowed – 200 rupees for the first of the caves, Tashi Kabum, and 500 rupees for entry to the more famous Luri cave temple and its current gompa 150 meters below. 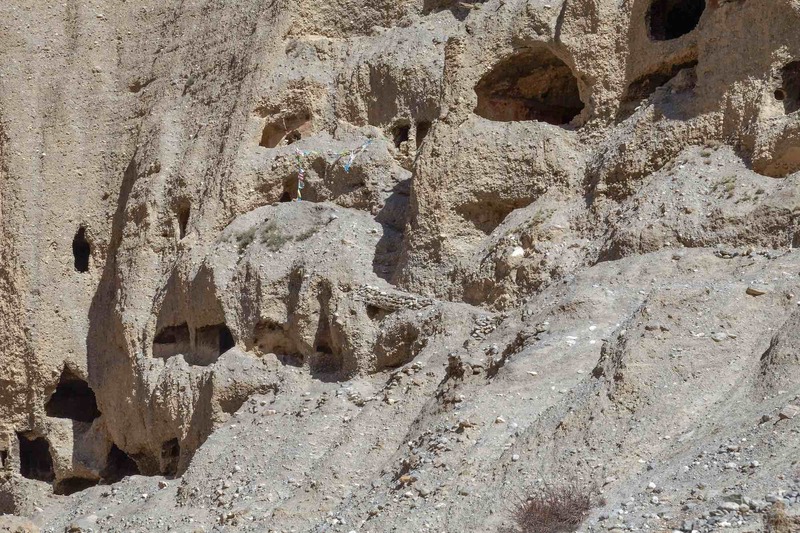 The Yara villagers have done some work on the path to the cliff and the cave and the drama that McCue mentions is gone. It is now a visit anyone can do without fear! 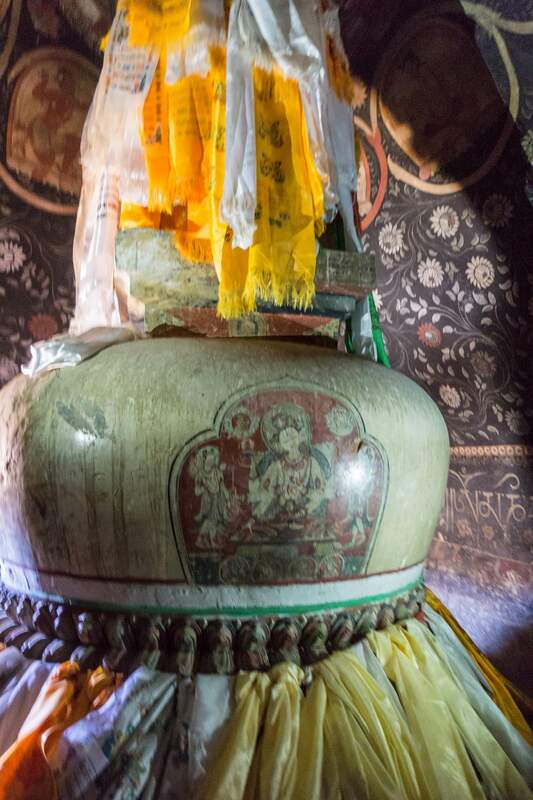 The focal point of the inside of the temple cave is a two-meter-at the base chorten. 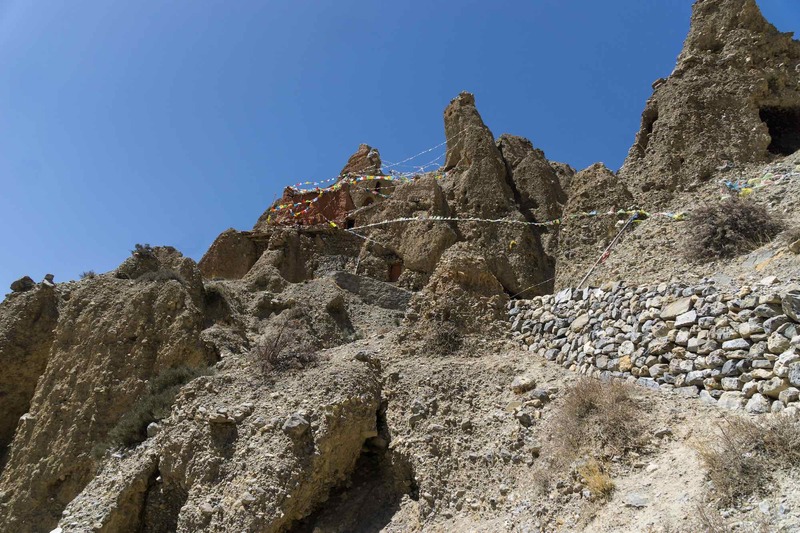 There are at least 1.5 meters of free space around the chorten. 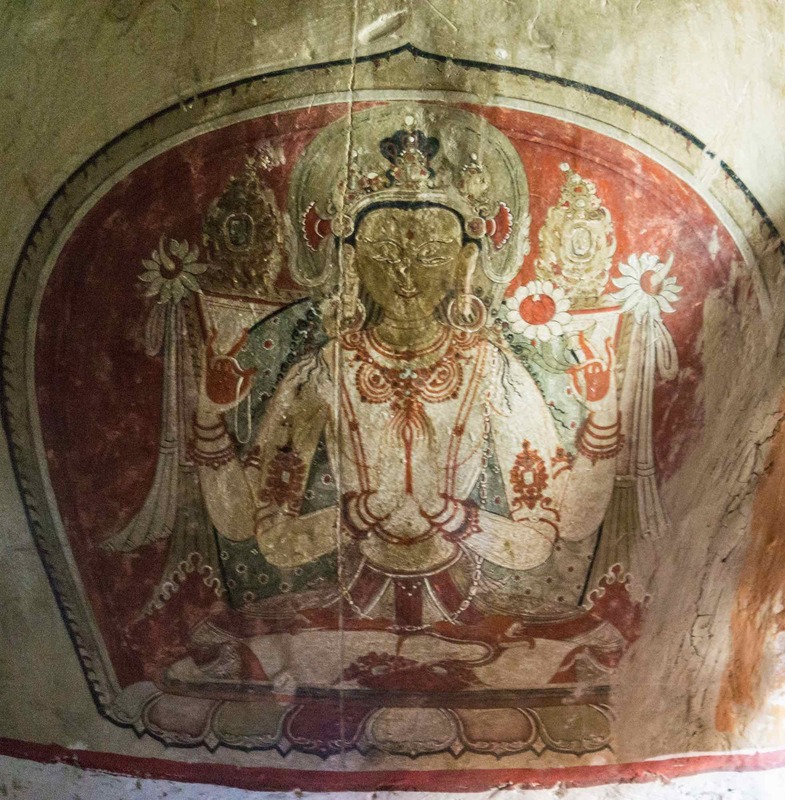 On the walls and ceiling, which were covered with mud plaster once the physical space was carved out of the cliff face, you find frescoes of various sorts – mythical or historical figures, important Buddhist symbols, and geometric or floral patterns. 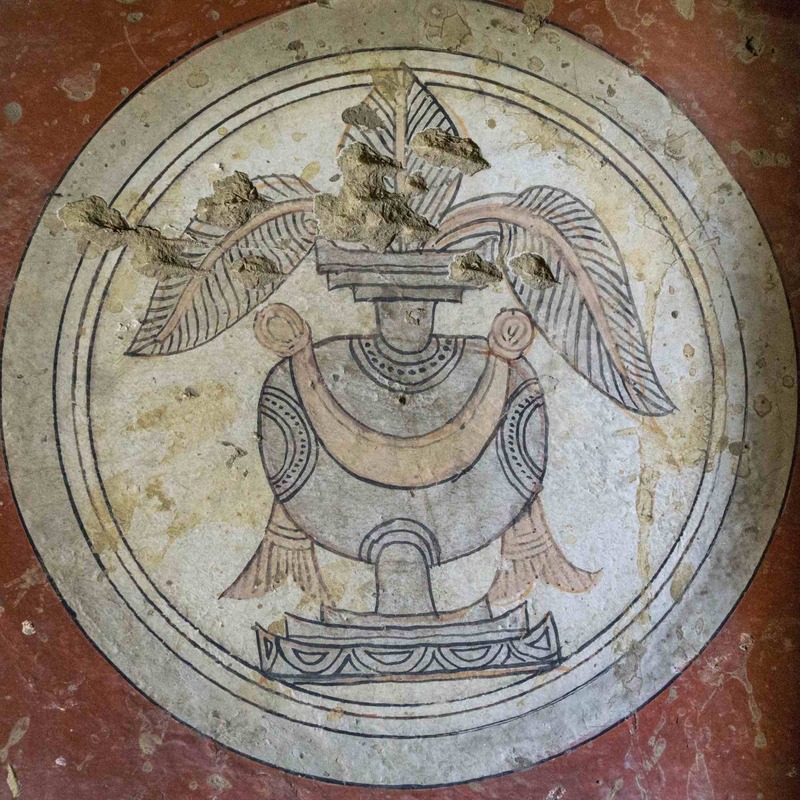 The ceiling of the cave temple has The Eight Astamangala nicely contained in a circular arrangement. 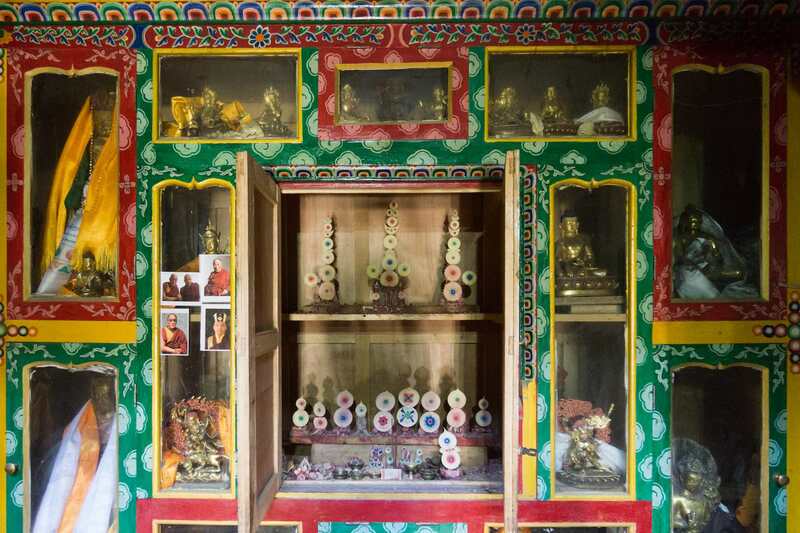 While the astamangala concept is used in the various Indian-subcontinent religious traditions (Hinduism, Jainism, Buddhism) since this was a Buddhist temple the narrative connects the eight objects to gifts presented to Siddhartha Buddha under the Bodhi Tree when he became the Buddha, the Awakened One. In the image below the following objects are illustrated, beginning with the parasol at the top and going around to the right. 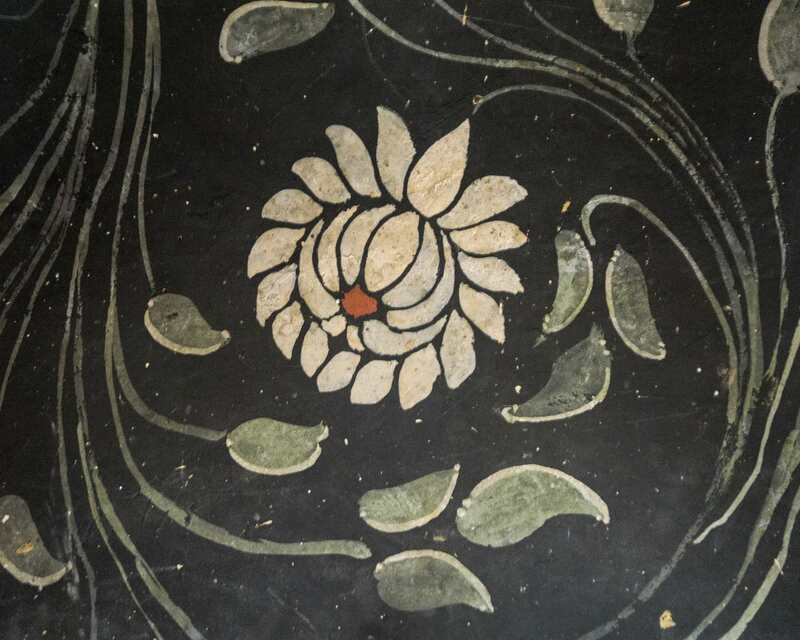 Lots of lotuses in the transition space between the ceiling and the wall paintings! I’m not sure whom the two wall frescoes below depict. 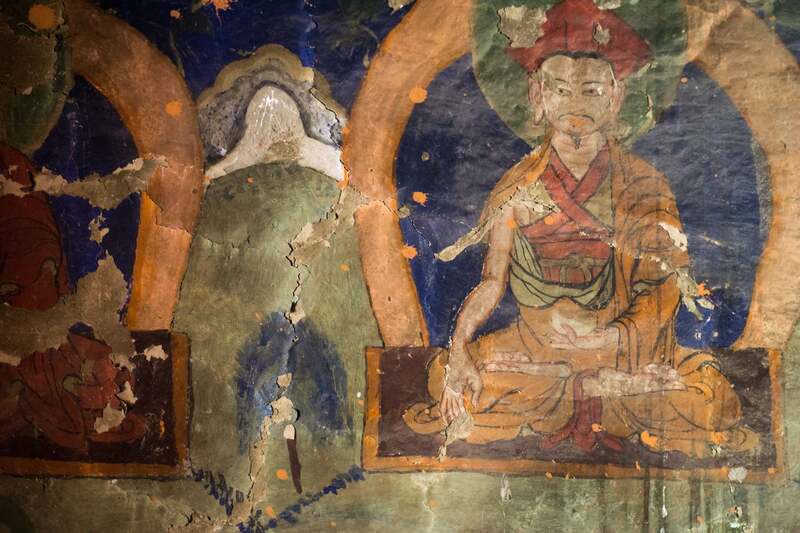 It could be Chenrezig (the Bodhisattva Avalokiteshvara) on the left and a lama or siddhi master on the right. 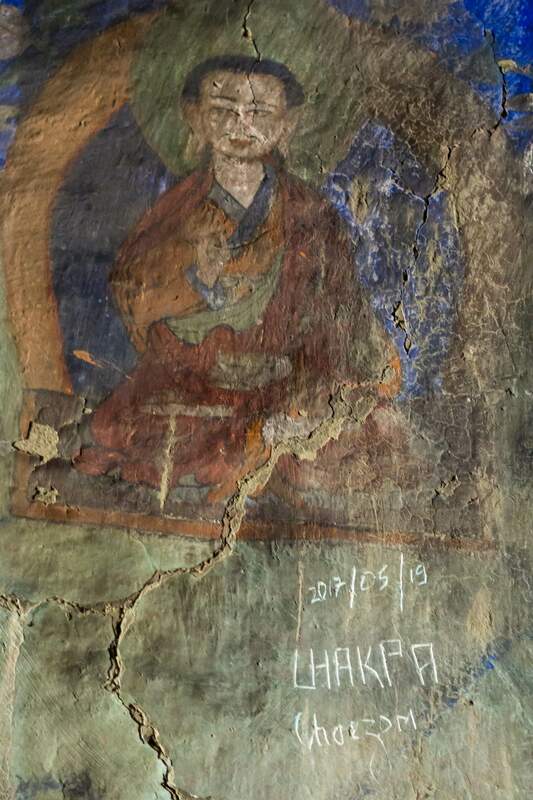 Unfortunately Tashi Kabum cave has been vandalized and the chorten is only in fair condition; the upper dome has been broken open, many of the bas-relief decoration pieces encircling the base of the dome are damaged or missing, and prayer text folios from inside the chorten are now lying scattered on the cave floor. 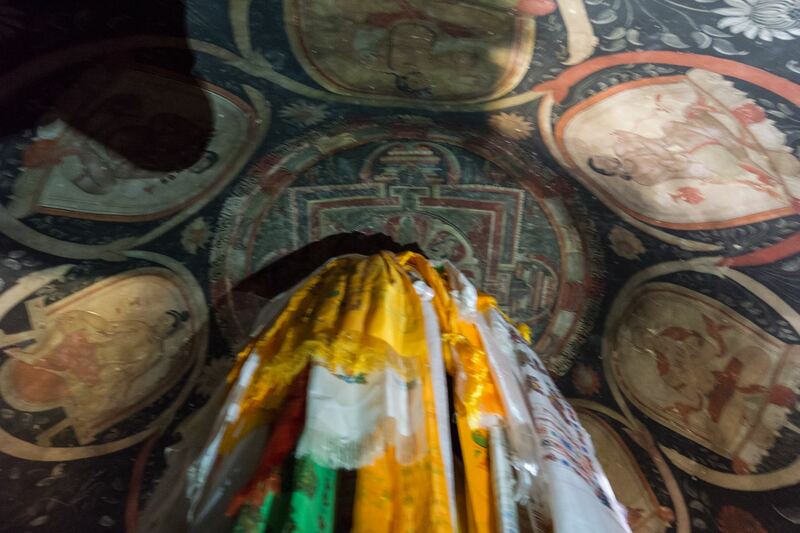 I can’t say I noticed the condition of the upper dome since it was draped so heavily with khatas, the Tibetan ceremonial scarves. If the khatas were not hiding the damage then it is likely that the guardians of the cave temple have had it repaired in the past 25 years. 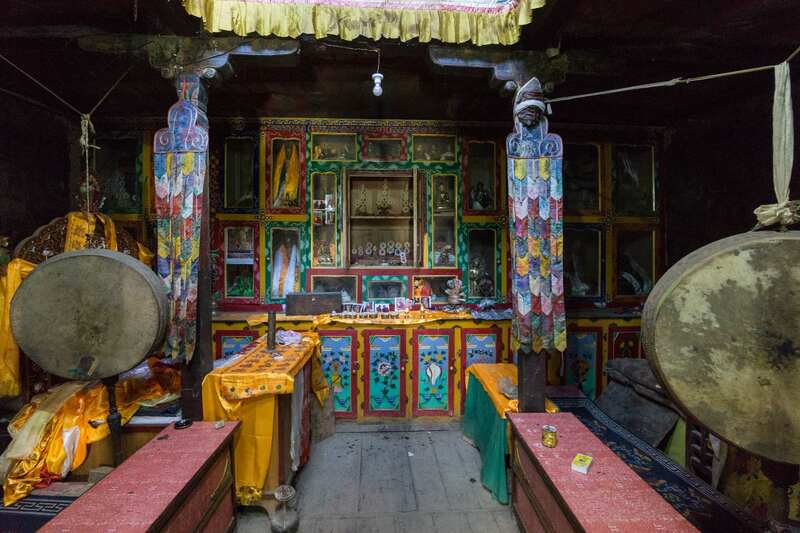 The lighting in the Tashi Kabum cave temple would prove to be better than that in the Luri Gompa later on that day. In both cases, now that I look at the results of my visit I wish I had taken more time and been more deliberate with my camera settings! 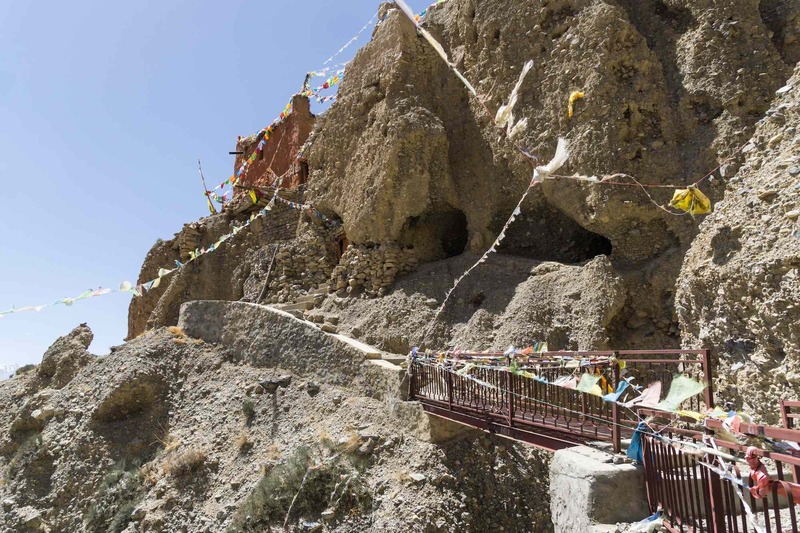 Still, along with our visits to the central shrine buildings of monasteries in Kagbeni, Tsarang, and at Ghar Gompa, those cliff cave temple visits were the cultural highlights of our trek. Our fifteen-minute visit done, we walked back down to the dry river bed and continued on our way to Luri. The Yara key keeper headed back to the village; in the afternoon another villager would show up at Luri to open up the door of the cliff temple there. 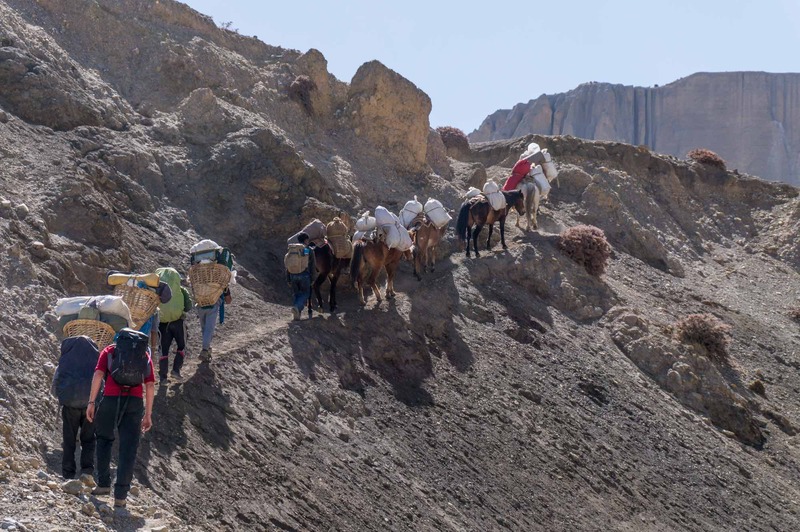 Our camp was set up not far from a herder’s rough shelter and animal pens constructed from boulders and mud. We had lunch in the dining tent – the green tent you see in the image below – and then relaxed for a while before heading up to the cliff caves for a visit. When I expressed my annoyance at the 500 rupee entrance fee – migawd! more than double what we had paid elsewhere! – my fellow trekker Rob was kind enough to point out that I was making a scene about $3.! 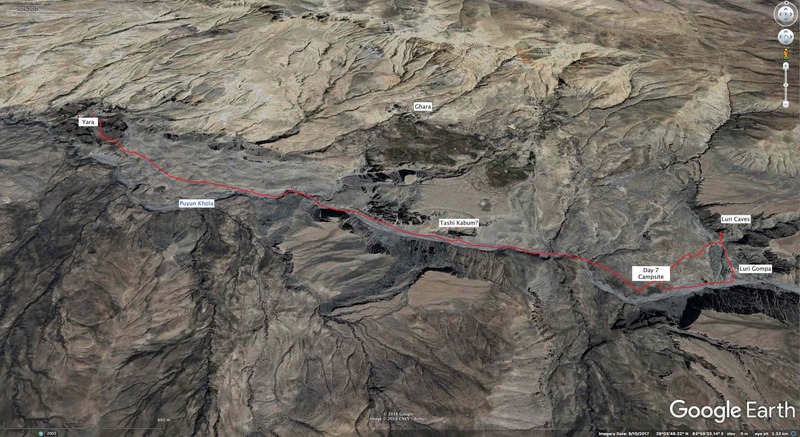 The image below shows the path up to the temple; some work has been done to make it safer. 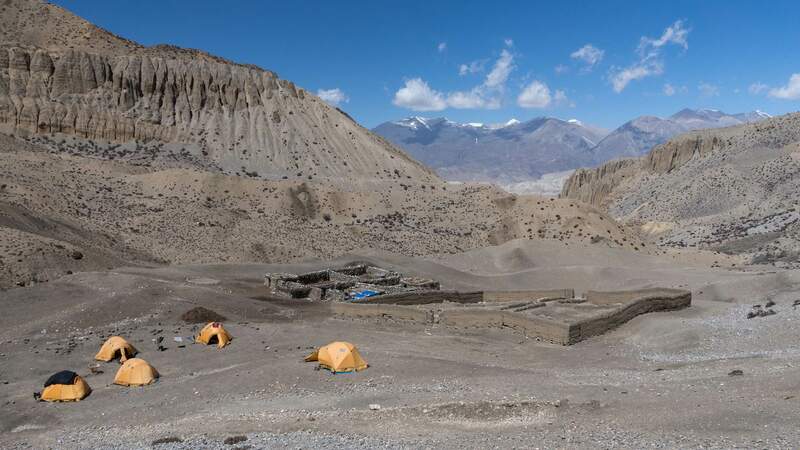 While the Tashi Kabum site did have another cave or two that were not accessible, the Luri site looks even more developed and larger. It included monks’ living quarters in separate caves though we only visited the temple cave, accessed by a ladder from a lower cave which had the locked door at its entrance. 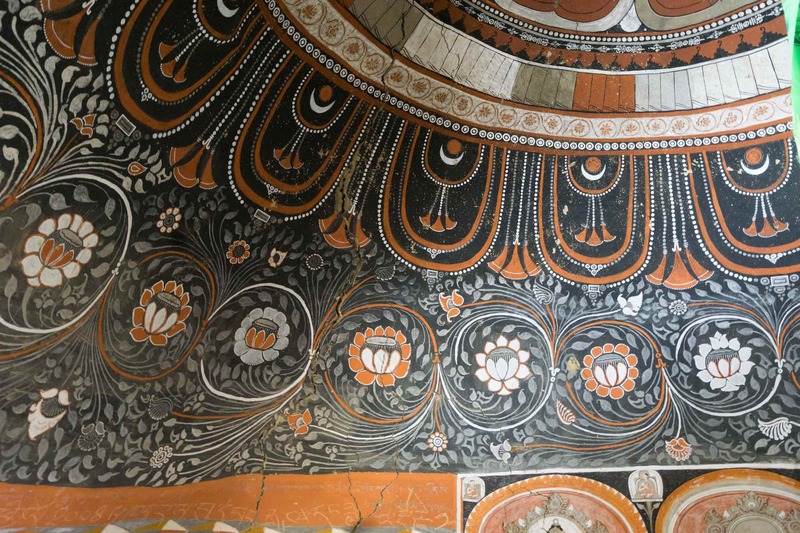 The mandala at the center of the dome is that of Akshobhya Buddha seated in the “touching the earth” pose in the middle. He is surrounded by eight goddesses, each representing one of the eight auspicious emblems. 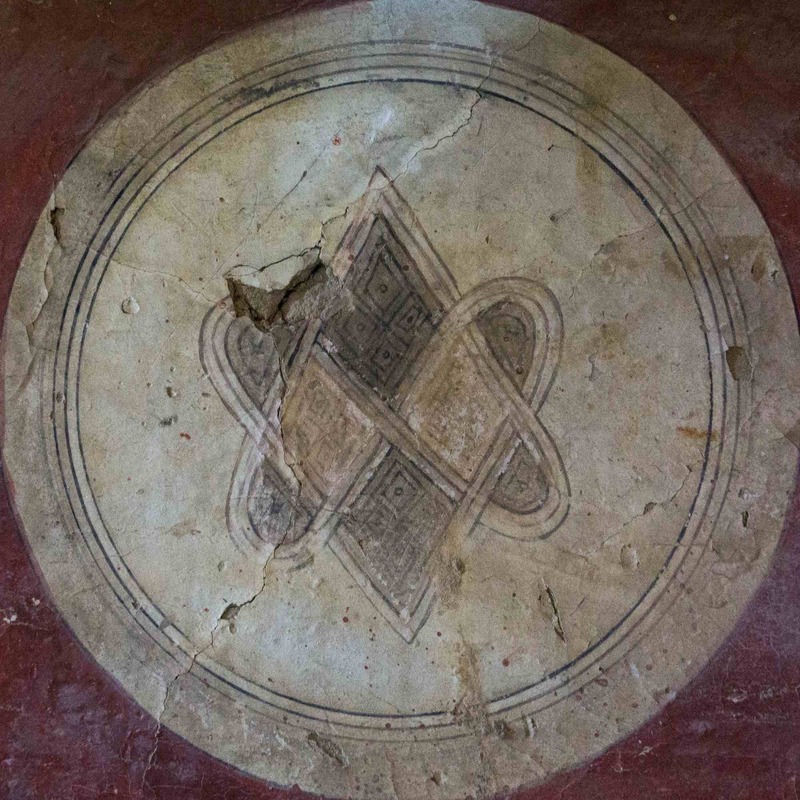 It echoes the Astamangala found on the Tashi Kabum ceiling. See here for a full description of the mandala. 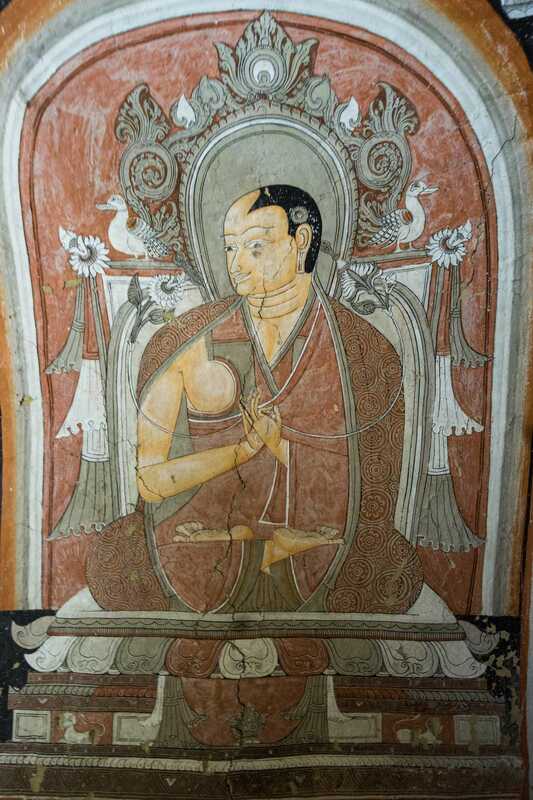 Below is another rendition of the image of the core of the Akshobhya mandala which is in the collection of the Rubin Museum of Art in New York. 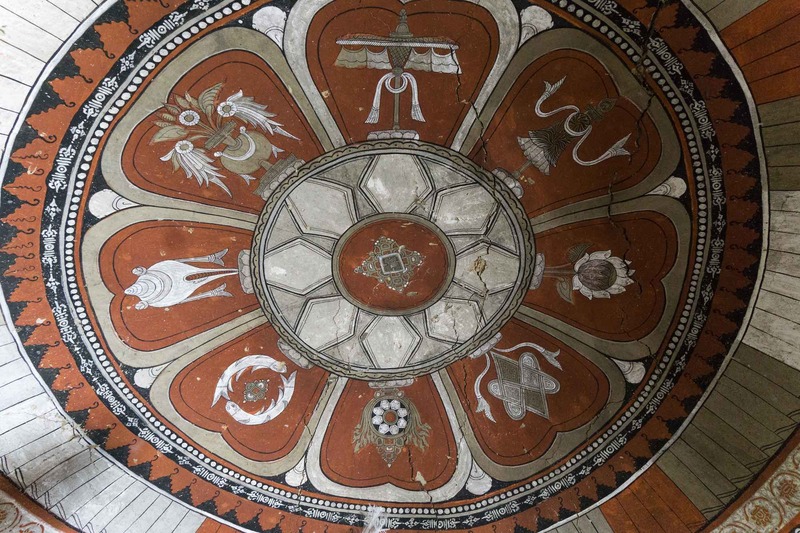 Surrounding the central mandala image on the dome is a series of eight portraits of either mythical or historical tantric masters (mahasiddhis). 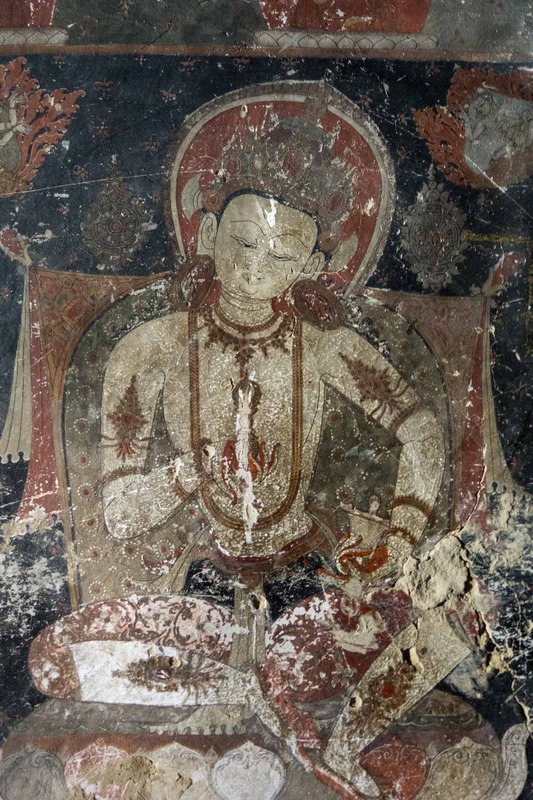 The one below, for example, is of Luipa, said to be a siddhi master from East India. 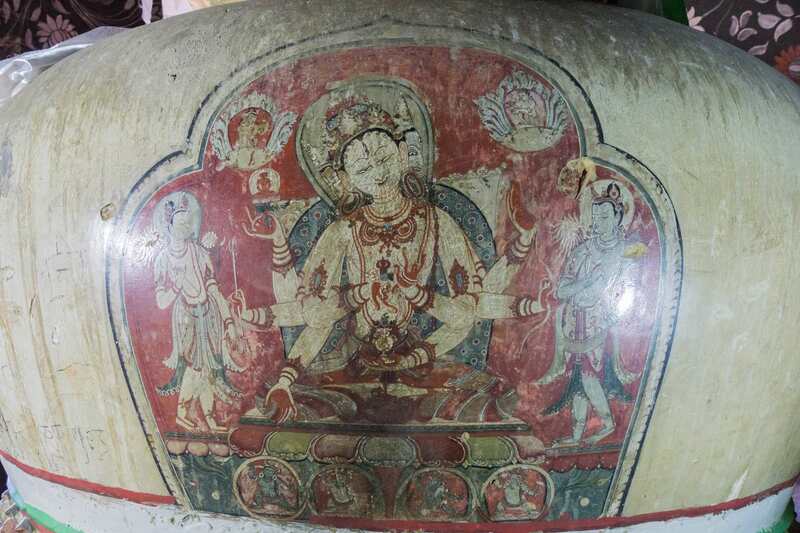 one of four images on the chorten at the Luri Gompa cave temple – White Tara? On the northwest face of the chorten is a painting of Vajrapani, a protector deity meant to look mean and tough. In his right hand (Sanskrit pani) he holds the thunderbolt (vajra) which represents compassion; in his left hand is the bell symbolizing wisdom. 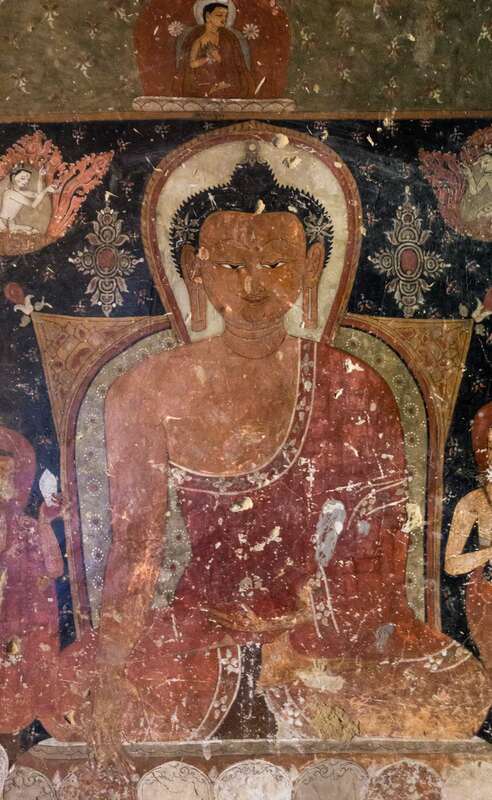 The following three paintings are on the Southwest wall – i.e. the wall you are facing as you enter the room. On the left, at the far end near the SW wall, there is a window that lets in some light. It may be why I focussed on these particular images! Lack of light was definitely an issue that I wish I had prepared for better – i.e. with a faster prime lens and better ISO settings! 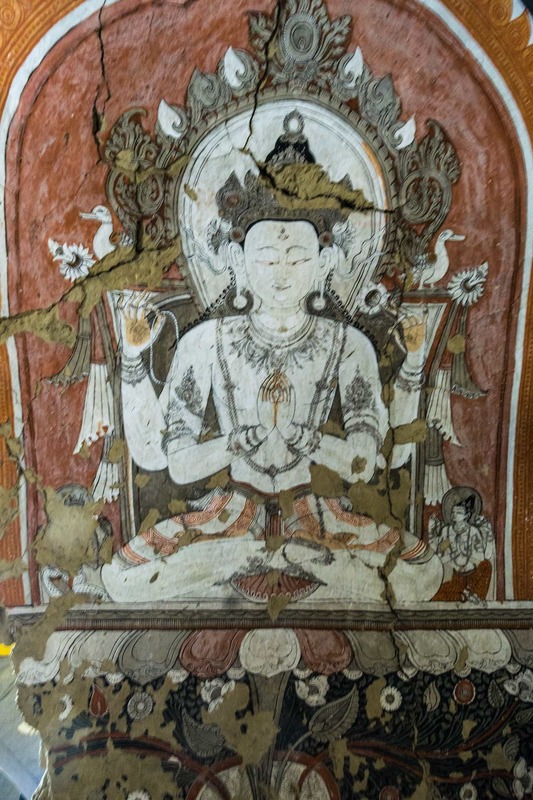 The above painting is the second of the five on the SW wall. It is of Siddhartha Gautama, the historical Buddha, also known as Sakyamuni. He is in the “touching The earth” mudra or hand gesture associated with the moment he became the Awakened One (i.e. the Buddha) under the Bodhi Tree. In his gesture, he was calling the Earth to be witness to his steadfastness in the face of Mara’s temptations. The next portrait, #3 in the sequence, is of Vajradhara, the Buddha above all Buddhas. One of his traits is his dark blue colour, as conveyed in this portrait. His crossed hand gesture is the diamond (Anjali) mudra and he holds a thunderbolt and a bell, which represent compassion and wisdom. The next portrait, #4 in the sequence (and the last I got a decent shot of!) I have not identified. The uncrossed legs and the thunderbolt and bell in the figure’s hands may provide a clue. On my way out I took some quick shots of the outer chamber’s series of twelve frescoes on the south wall. As the images below will show, they seem to come from a different time and have a less accomplished look about them. 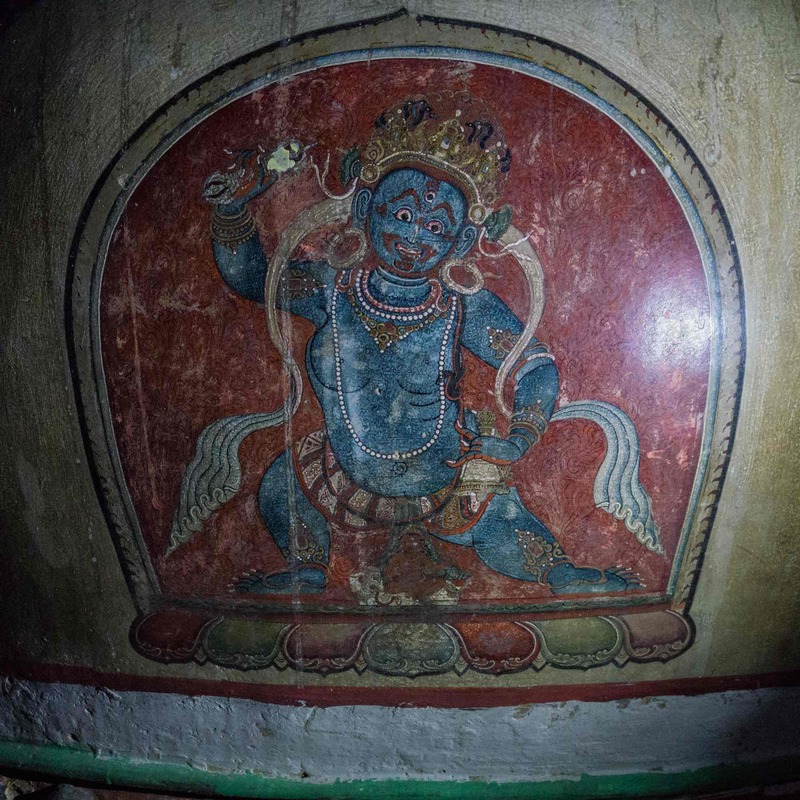 a wall painting from the Luri Cave temple – Guru Rinpoche? 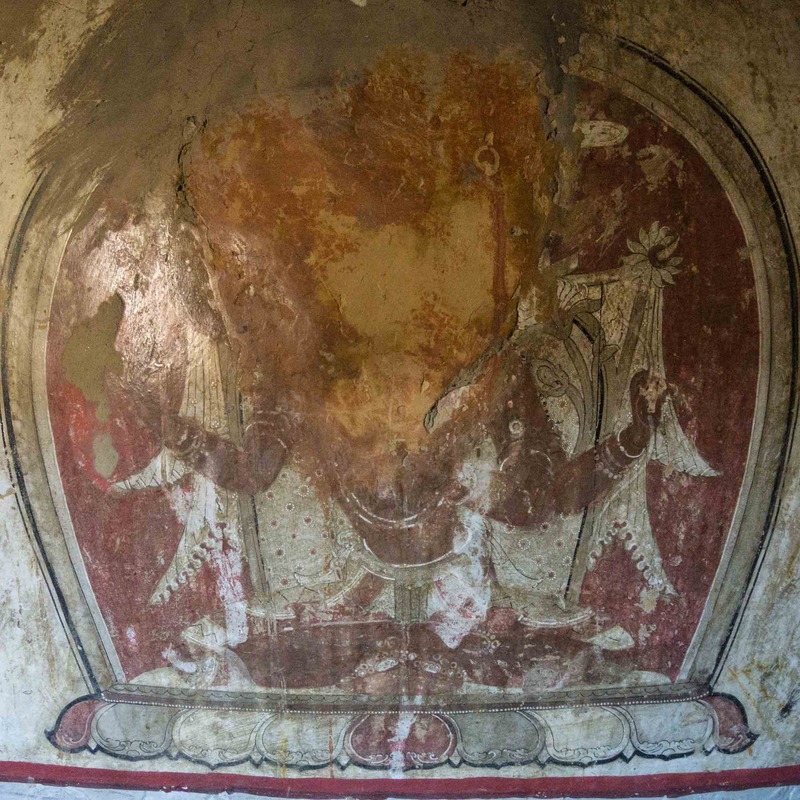 The two frescoes below are the second and fourth of the sequence. I wish I would have taken the time to put on my 10-18 mm wide-angle lens and spent the minute or two needed to capture the entire set. 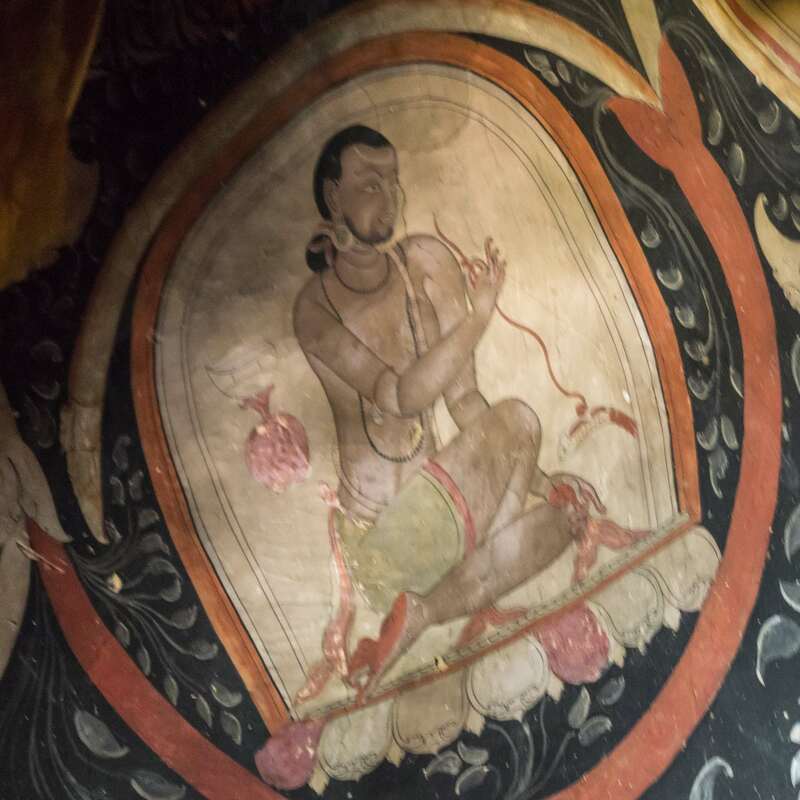 Luri Gompa wall painting – Guru Rinpoche in teaching mudra? 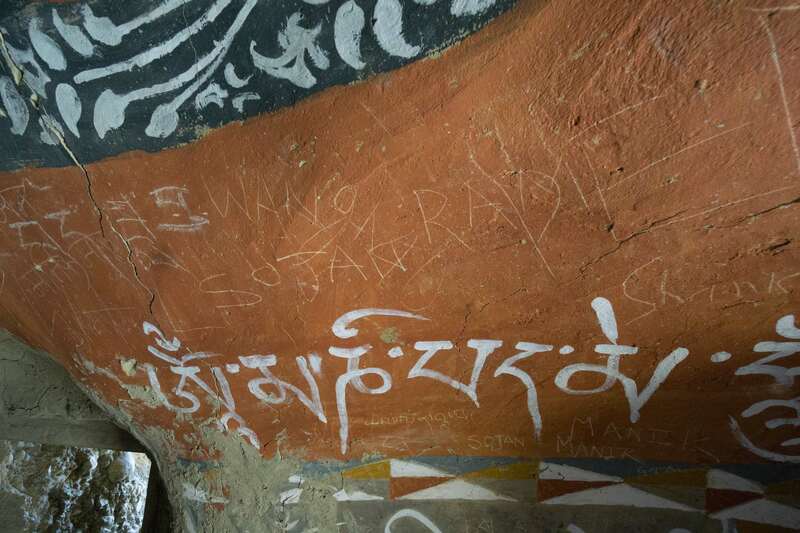 In spite of the locked doors and the stewardship of the Yara villagers, there was evidence of recent graffiti on the walls of both the Tashi Kabum and Luri caves. From the names, it appears to be Nepali in origin. See below for an example from 2017. 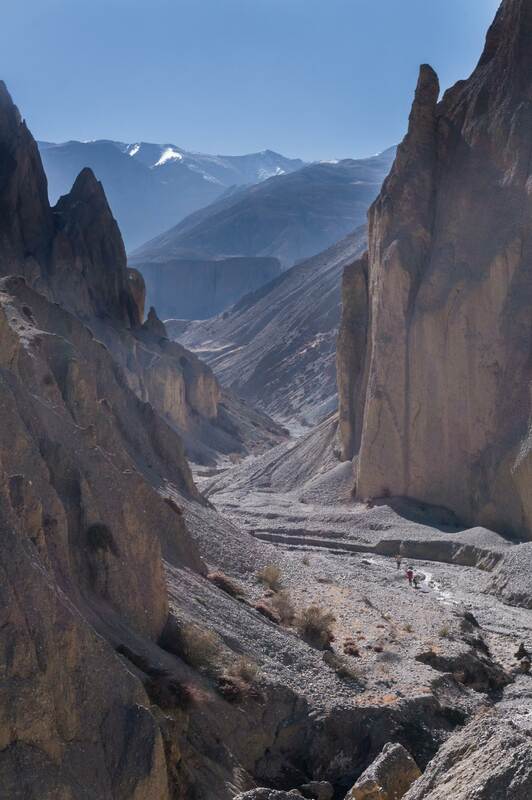 Back outside it was down the staircase and past three crumbling chortens to the modern gompa 100 meters below. 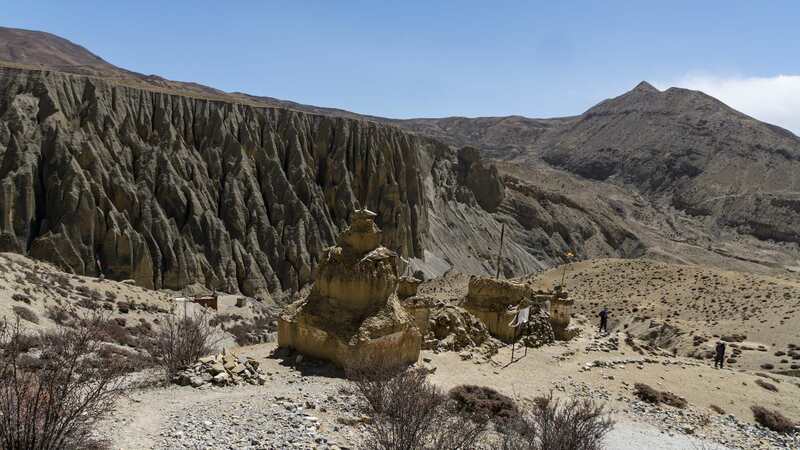 The info board – similar in style to the one by Ghar Gompa – provides some historical background to the cave complex and the monastery down below. The monks are members of the Kagyu sect of Tibetan Buddhism, specifically the Drukpa lineage. 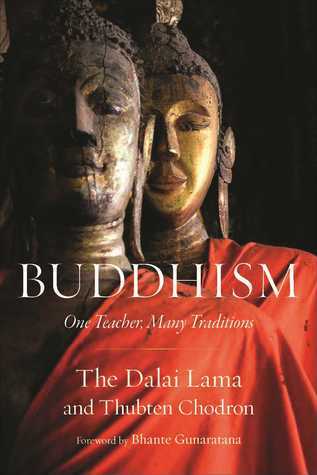 The Dalai Lama’s recent book (2104) Buddhism: One Teacher, Many Traditions only scratches the surface of the dazzling complexity of the Buddhist tradition. Reading a brief Wikipedia entry on the sect brought home for me yet again how little I know about on-the-ground Buddhism as it is practised by real believers. Day 7 of our trek had been a special one. It would mark the end of our cultural tour of the upper Kali Gandaki region. Starting the next morning we would be doing some serious uphill walking and gaining altitude at a faster pace. 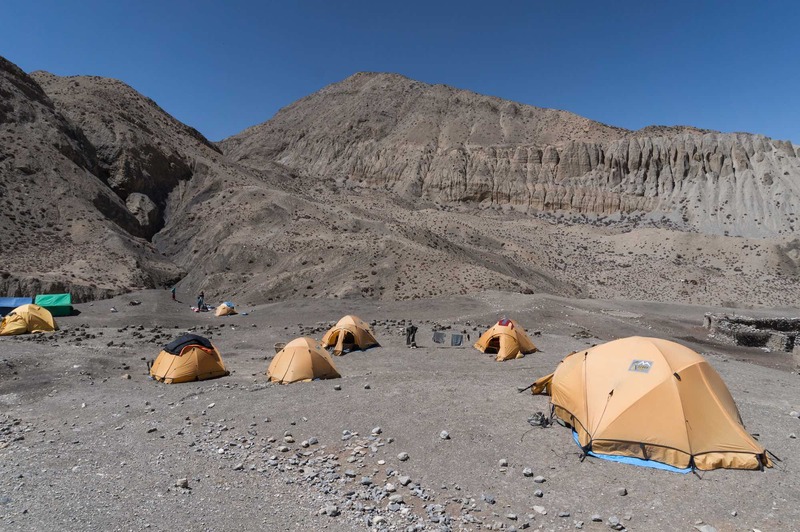 Instead of our 3840 m campsite at Luri we were heading for one at 4755 – a 900-meter increase in one day. The route for the next four days was essentially the Hindu pilgrims’ trail to Damodar Kunda, a collection of three shallow “lakes” with reputed karma-absolving properties. 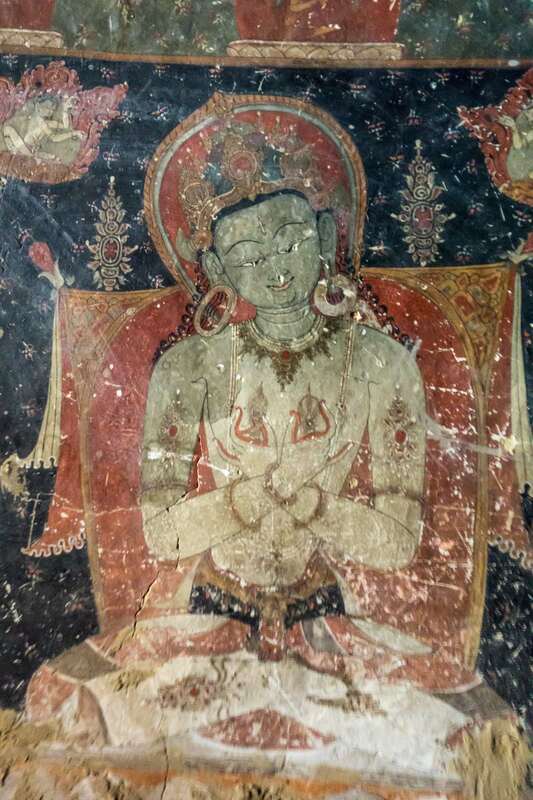 A webpage by Philip and Marcia Lieberman titled Tibetan Buddhist Wall Paintings (click on the title to access) hosted by Brown University was my source for much of the detailed information about the Luri Gompa caves. It dates back to 2003. As well as a comprehensive set of images it has excellent floor plans and wall layout that helped me reconstruct my 15-minute visit. 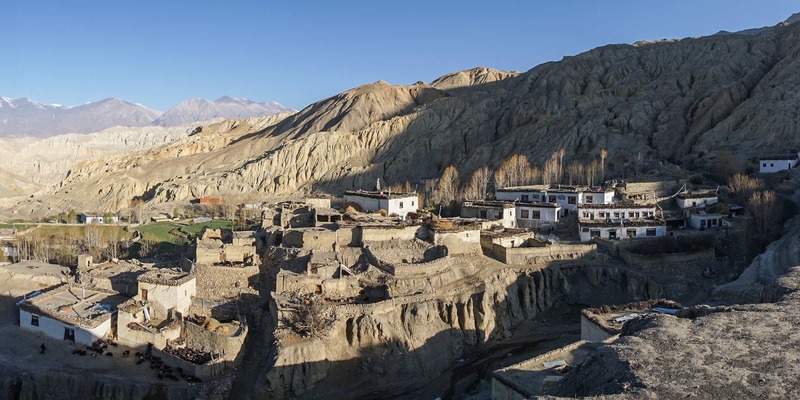 It has even more coverage of the gompas of Lo Manthang and would make an excellent guide for your visit.